Watermelon (Citrullus Lanatus) is native to Africa, possibly the sun-drenched Kalahari Desert region in the South. That’s where explorer Dr. David Livingstone found them growing wild in the 1850’s. There is archaeological evidence that watermelon and other agricultural crops were grown around 3000 BC in West Africa near the Sahel Region. Evidence in Egyptian tombs and hieroglyphics on walls throughout the Nile Valley show that watermelons were cultivated over 2000 years BC. Watermelon followed the trade routes reaching the New World in the 1500’s, where it was introduced to North American Indians by Spanish explorers. It has been said watermelon cultivation spread faster than European exploration. IS WATERMELON FRUIT OR VEGETABLE? We think of watermelon as a fruit, but there has been hot debate on whether it is fruit or vegetable. Actually, it shares some characteristics of both. Watermelon belongs to the Cucurbitaceae plant family and develops from pistillate (female) flowers of vining annuals that have coiled, climbing tendrils. The flowers are pollinated mainly by honeybees. Botanically speaking, the fruit is the ripened ovary, with the seeds, of a flowering plant. Watermelon and other “cucurbits” like cucumbers, pumpkins and squash have thick, leathery rinds and are technically a false berry known as a ‘pepo.’ The fleshy inner fruit has many seeds and fuses with an outer covering to form a hard rind. 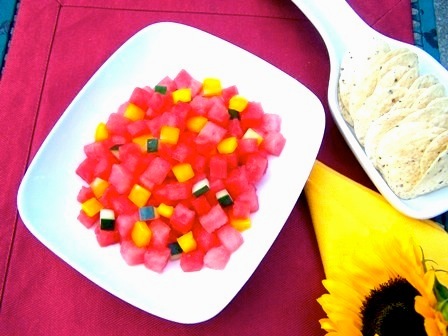 We prefer to eat the true fruit of the watermelon or the seeded pulp. Watermelons are grown and harvested like vegetable crops. The National Watermelon Promotion Board says watermelon is primarily eaten as a fruit, out-of-hand, as dessert or in salads because of its sweet flavor and refreshing qualities. Until the 1940’s, most watermelons were round with softer rinds. They didn’t stack well and were often in poor condition after being hauled to market. The best melons came from the family garden, but even these exhibited poor keeping qualities. Horticulturist Charles Fredric Andrus of the Agricultural Research Service, (ARS), U.S. Vegetable Laboratory in Charleston, South Carolina began developing a disease and wilt-resistant watermelon. After several tries, he struck gold in 1954 with the release of a cultivar known as, “that gray melon from Charleston.” The rind was harder and disease resistant with an oblong shape that was better for stacking and shipping. Most watermelons cultivars today trace their lineage to the Charleston Gray. Laboratory scientists and Clemson University researchers soon began developing watermelons with an environmental, friendly genetic resistance to broad mites, discovered on watermelon plants by a plant pathologist in Charleston. The first seedless melons were developed by Japanese professor, Dr. H. Kihara in 1951. Improved varieties were developed in partnership with U.S. plant geneticist Dr. Orie J. Eigsti, who developed the gold standard hybrid for seedless watermelon after Dr. Kihara’s death. The watermelon flesh is sweeter and crunchier and the seedless ‘heart’ runs all the way to the rind. This gives a longer shelf life since the breakdown of watermelon flesh usually starts around the seeds. Interestingly, innovative Japanese farmers grow square-shaped watermelons in square glass boxes for easy stacking and storing. Japanese melons are an expensive treat commanding around $70.00 per melon. When I lived in Japan, I found the taste exceptional and the melons lovingly wrapped in tissue paper on display in markets. South Carolina’s watermelon harvest continues until the end of August. Commercial production centers in the low country and upstate Sandhills region. According to food historian John Martin Taylor (formerly of Charleston), early Greek settlers brought the method of pickling watermelon with them to Charleston, South Carolina. Carolina watermelons can range from about 4 pounds to 40 pounds – and larger. They might be round, oval or elongated. The soft flesh comes in a rainbow of colors: bright red, rosy pink, sunny yellow, deep orange, white and even green. Big juicy 20 pound watermelons are perfect for a large group. 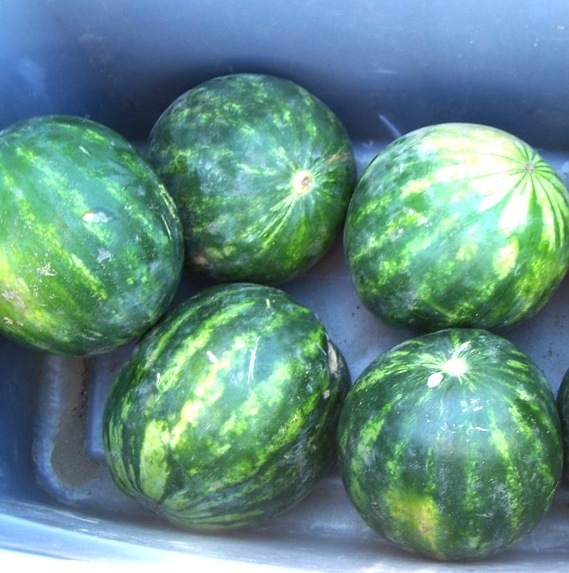 Eight to ten pound hybrid ‘icebox’ melons take up less refrigerator space. The flavorful Sugar Baby watermelon is the ‘icebox’ standard with a rind that is almost black when ripe. Shrinking households appreciate the new super-sweet miniature or “personal” melons introduced in 2003. Ranging about 3 to 8 pounds, they have thinner rinds with less waste and are very nutritious. They are handy to carry on picnics and outings. IT’S GOOD FOR YOU, TOO! Watermelon is not just another pretty fruit! It is low in fat, high in fiber and about 54 calories per cup, offering guilt-free enjoyment. One wedge provides two-thirds of the adult daily requirement of vitamin C. Watermelon offers Vitamins A, B6, B1, potassium and magnesium. It has been certified as a heart-healthy food by the American Heart Association. More good news! Japanese and USDA scientists found that small seedless watermelons are abundant in beta carotene and lycopene – powerful antioxidants. Ounce for ounce, they contain twice the amount as full-size watermelons with seeds. Lycopene is the red pigment that gives certain foods their color. Other top sources are tomato, guava (listen up – all you folks in Hawaii!) and pink grapefruit. The ‘redder’ the watermelon flesh, the more lycopene it contains. Seedless watermelons are the most red and concentrated of all melon varieties. Darker skinned melons often have redder flesh, as well. A high level of Lycopene in the diet has been found to correlate with reduced incidence of certain kinds of cancer and reduced risk of heart attack. 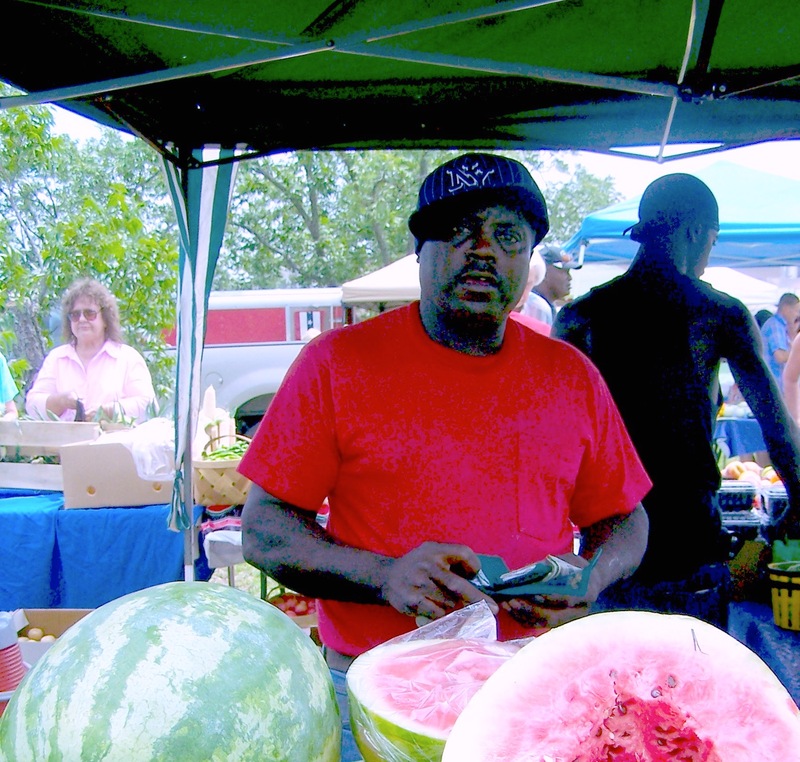 Visit your local farmer’s market for some of the tastiest watermelons. Look for symmetrical fruits that are heavy for their size with dull unblemished skin. If the melon smells fragrant at the stem end, it is probably ripe. If the underside of the melon is DEEP yellow where it rested on the ground, it may be overripe. If white or green, it is underripe. Look for a light yellow color. Watermelons do not continue to ripen if cut from the vine too soon. Store a whole, uncut watermelon for a week out of direct sunlight at 50 to 60 degrees F. For a few days storage, you can even put it on or near a floor air conditioning vent. When sliced, lightly cover the melon pieces; refrigerate up to a couple of days. Watermelon can be eaten as a snack or added to salads, salsa or cold summer drinks. 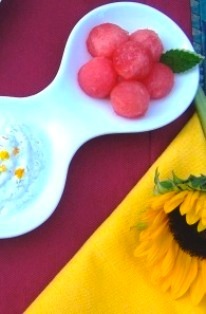 Watermelon balls are tasty served with a creamy dip. 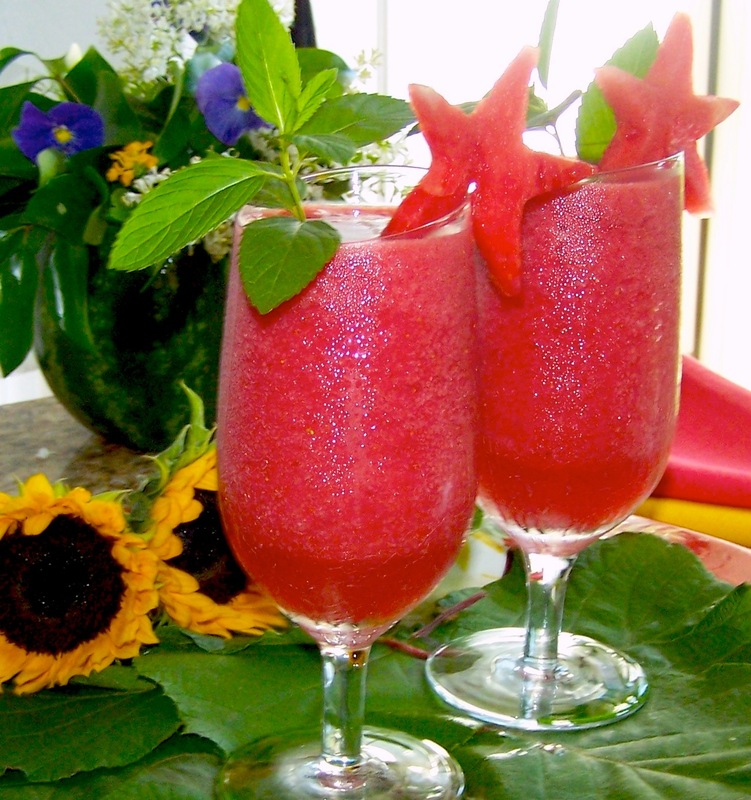 You can make watermelon juice by pureeing the seedless pulp in a food processor or blender. Press puree through a fine strainer, catching the juice in a large bowl. Drink the tasty juice plain or use in beverage recipes or freeze to make sorbets or ice cubes. You can also add the juice to jello or molded jellies. Scoop out melon balls and combine with whole berries, grapes and coconut for a summer treat. Serve in a fruit bowl made from half of a scooped-out watermelon shell with carved edges. A small, whole scooped-out melon makes an attractive vase for flowers, as show in the top photo. Put the flowers in a small container of water and place inside the hollow melon. For a “spririted” party melon, cut a plug in the top and fill with vodka, rum or gin. Push the plug back into place and chill for about an hour. The juice can be sipped with a straw; the fruit cut into wedges or cubes. 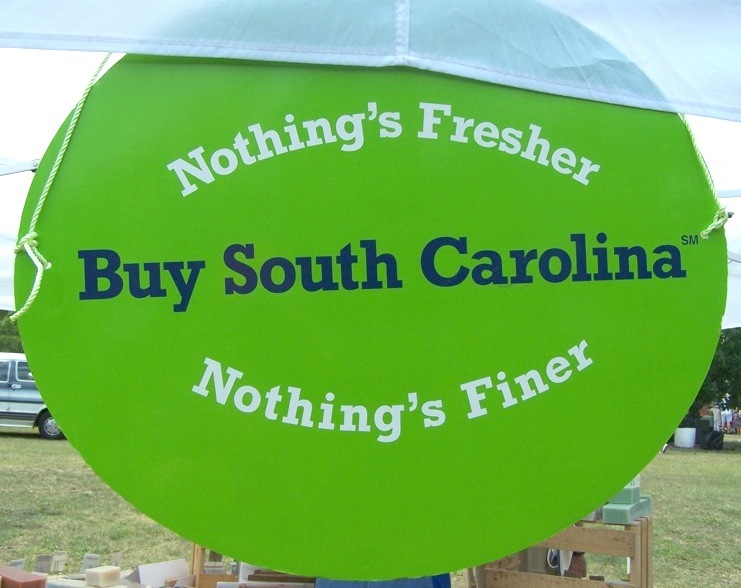 Check local farmers’ market like the Sandhill Farmer’s Market for ripe delicious South Carolina watermelons. I garnished each glass in the photo above with a star-shaped slice of watermelon cut with a small cookie cutter. You could also garnish each glass with a fresh strawberry. Put half the watermelon cubes, half of the sorbet and 2 berries into a blender. Blend until smooth. Add about 1 tablespoon of lemon juice, OR to taste. Pour smoothies into 2 tall chilled glasses. Blend remaining ingredients then serve. Garnish with fruit and sprigs of fresh mint. Makes 2 to 4 servings. This tasty salsa can be spooned over grilled fish or chicken, served with cottage cheese or offered as a dip with sturdy chips. Prepare bell pepper, cucumber and watermelon; set aside. In a medium bowl, combine remaining ingredients. Add watermelon mixture to spice paste, gently tossing to coat. Cover and refrigerate at least 1/2 hour. Drain salsa before serving. Makes 2 to 3 servings. Crumble some feta or goat cheese over the salad for a tasty variation. In a large bowl, mix together cumin, salt, cayenne, and chili powder. Add watermelon cubes, lime juice and cilantro to the spice mix. Use a large spoon to combine watermelon with the spice mixture. Serve at once or store in the refrigerate up to one hour. Makes 4 servings.